The Hyde Park Barracks are located in Knightsbridge in central London, on the southern edge of Hyde Park. Historically they were often known as Knightsbridge Barracks and this name is still sometimes used informally. Hyde Park Barracks is three quarters of a mile from Buckingham Palace, close enough for the officers and men of the Household Cavalry to be available to respond speedily to any emergency at the Palace and also to conduct their ceremonial duties. The first buildings on the site were constructed for the Horse Guards in 1795, and a riding school and stables designed by Philip Hardwick were added in 1857. 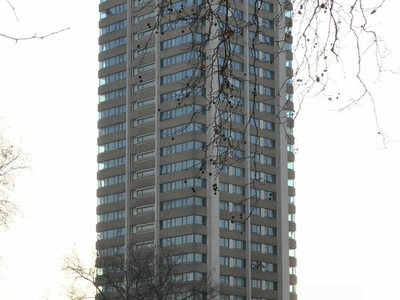 These buildings were replaced with new ones by Thomas Henry Wyatt in the 1880s, which in turn were demolished to make way for modern buildings designed by Sir Basil Spence, and completed in 1970. It was built to accommodate 23 officers, 60 warrant officers and non-commissioned officers, 431 rank and file, and 273 horses. Here's the our members favorite photos of "Skyscrapers near City of Westminster". Upload your photo of Hyde Park Barracks!